What do they have in common, Peter Cunningham, expert in mediation from the Nelson Mandela Metropolitan University; Irina Bokova, Directrice-Generale of Unesco; and Ivan Pera, director of the Foundation Charter of Peace addressed to the UN? All are part of the team of 43 national and international experts who will be at the Second International Conference "Building Peace in the XXI Century" to be held later this month at the University of La Salle. In an interview with Legal Affairs, the Vice Chancellor of the University, Frank Ramos, spoke about the the event and their expectations of assistance. How did this conference come about? Several things come together to make it possible. The first is that the University of La Salle has had a new educational proposal in recent years to create training processes in order to transform Colombian society . . . 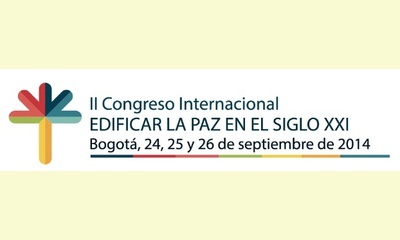 The second is that, the new rector, Carlos Gomez attended two years ago the first peace congress, an initiative of Letter of Peace addressed to the UN, . .
And the third concerns the progress of the congress. Since it coincides with the peace talks, it took on a more significant relevance. We might say it has been a pleasant coincidence. Precisely. Considering its coincidence with the peace process, is there any cooperation from the government or they are going to participate? President Santos had the opportunity earlier this year to meet the Utopia project and has been very interested in the subject and its experience as a teaching method to replicate. He knows about the Congress and was interested in coming but he has to go to the UN. However, we are confident that members of the presidency can attend. . .
What issues will be central? The first is the issue of the role of women in these contexts of violence and peace . . . The second major issue is the new rurality in the context of peace. Colombia is an agrarian country. We have considered ourselves urban, but the vast rural population has been invisible. The issues of conflict have taken place primarily in the rural areas. A third and fourth issue has to do with creating a culture of peace. Even if we eventually sign a peace accord with the guerrillas that's just the first step, the other is to create a collective consciousness and a culture of non-violence where the problems are not resolved at the point of shooting and machete but dialog. That cannot be accomplished overnight and it is most important. And a fifth theme is historical memory, and post-conflict reconciliation and that means how to think about history, how to look back, remember and not strengthen the themes of revenge but think about how to turn the page so as to benefit generations to come. In the end we hope to develop a very simple document with all these issues in online version that serves as a road map and guide for people to know what you can do from home or work, for peace. . . This report was posted on September 11, 2014.